HYDE – Though at times the score was close, Clearfield was bested yet again by the Bald Eagle Area Eagles at Tuesday night’s Bison wrestling home opener that featured 11 main bouts and two pre-match exhibitions. The match began at 132 pounds, but most wrestlers on both teams bumped up a weight throughout the night. 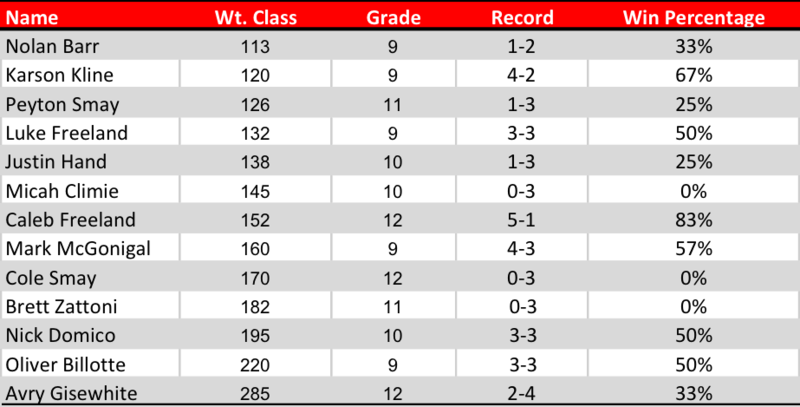 Clearfield was able to get five wins out of the bouts wrestled and picked up bonus points in two of those bouts. In return, Clearfield surrendered four pins and a late major decision to give up bonus points in five of the six matches they lost. Given that and the three forfeits this young Bison team surrendered at 106, 113, and 120, respectively, they were defeated by the Eagles by a dominating 49-20 score. Picking up the first win for the Bison was freshman Luke Freeland (3-3) at 138 pounds. After leading Bald Eagle junior Devin Kibe 2-0 to start the second period, Freeland begin to put on a clinic, as he put on an additional eight points in the middle period and five more in the third to win 15-4. This put Clearfield out in front for their only lead of the night, 4-3, and they wouldn’t win again until Luke’s senior brother Caleb Freeland (5-1) would take the mat after the Bison gave up two pins in a row. Using only 28 seconds, Freeland pinned junior Bald Eagle Ben Yetsko at 160 pounds to close the score to 15-10 in Bald Eagle’s favor. Following the momentum, freshman Bison Mark McGonigal (4-3) faced off against senior Richard Taylor. McGonigal wrestled quickly and efficiently, racking up four takedowns en route to his 10-3 victory over his Bald Eagle foe at 170. Late in the third period, he brought the crowd alive when he was nearly taken down and immediately countered with a hard switch for his final takedown of the night. This made the match score 15-13, Bald Eagle. Clearfield then gave up a major decision and a pin at 182 and 195 before sophomore Nick Domico (3-3) took the mat at 220 pounds. Domico used a takedown and a reversal in the first two periods to go up 4-0 against freshman Chandler Burns. In the final period, Domico worked two sets of near-fall moves to get bonus points and earn a 9-0 major decision victory. 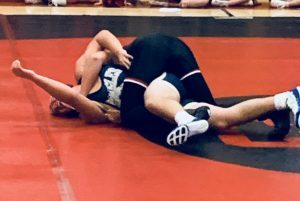 Following a fall at heavyweight and three forfeits, the final match of the night was wrestled between Clearfield’s freshman Karson Kline (4-2) and Bald Eagle sophomore Drake Holderman. Kline wrestled back from a 2-1 deficit midway through the third period when he was able to run an arm bar for three nearfall points. Following a trade-off of reversals, Kline came out on top 6-4 as the buzzer rang, but this was too little too late as the Bison ended the night down 49-20. The Bison are now 27-36 overall in individual matches wrestled on the year with nine pins and major decisions to boast, and their team record is 0-1. With the first match out of the way, the Bison will be back in action on Friday against the defending district champions at DuBois. The match will begin at 7pm.